Around this time last year I made one of the easiest, but also one of the bravest decisions of my life. It was easy, because nothing else made more sense. But it was so scary, because failing at this would mean failing at my ultimate dream. And that felt truly vulnerable. It still does. But I know that regardless of how long it will take for me to get to a place where I can I finally sit back and say "I've done it!," nothing could make me give up on it. Whilst I haven't achieved what I hoped I would, yet - with every step, I am going forwards. And at every step of the way, I am growing, improving and learning. And so is my vision. That, to my endlessly curious mind, is the greatest form of fulfilment. The problem with being one of those people who know they have a whole lot of potential,but it's accompanied by incessant perfectionism, is that in my own mind - I'm always bound to be some kind of failure. I am harder on myself than anyone else in my life is on me, and too often I measure myself up to unattainable standards. If I'm not exceptionally good at something I have literally just started, I have a terrible habit of being immediately disappointed in myself. Naturally, a lot of my learnings this year were about patience, compassion towards myself, and measuring myself by the person I am, rather than the things I have done or achieved yet. To do lists grow, but so do we, as people. And the later is far more important. I may have not been able to go full-time with my dream job, or feel like I make my family proud of my achievements, but I have maintained integrity at every step of my way, I handled many difficult situations with grace and honesty, held my head high and have consistently continued to create, learn, improve and pursue excellence at everything I do. But most importantly for me, this last year I got my spark back. I got my passion, my determination and grit back when I decided to take control of my ship, become the captain of my own life and steer it to where I want to go, rather than where the sea and wind throws me. My first step was to move away from London, to make a leap of faith and move to a small town in UK that I had visited a few times, but didn't really know, have any friends or relatives in. It completely turned my life around, and I went from a place where I felt really lonely, scared and lost, to a place where, regardless of daily ups and downs, I feel far more calm, motivated, independent and able to walk my own path with courage and faith. I may have not conquered all my goals and achieved all my dreams this year, but I did go forwards in leaps. In fact, I'm so far ahead of where I was only just a year and a few months ago, that it's hard to even think of it all as being in the same lifetime. This last year, I learnt many valuable lessons, improved my skills, made good connections and laid strong foundations for achieving what I dream of. I am ready to start 2018 stronger, wiser and with an improved plan. 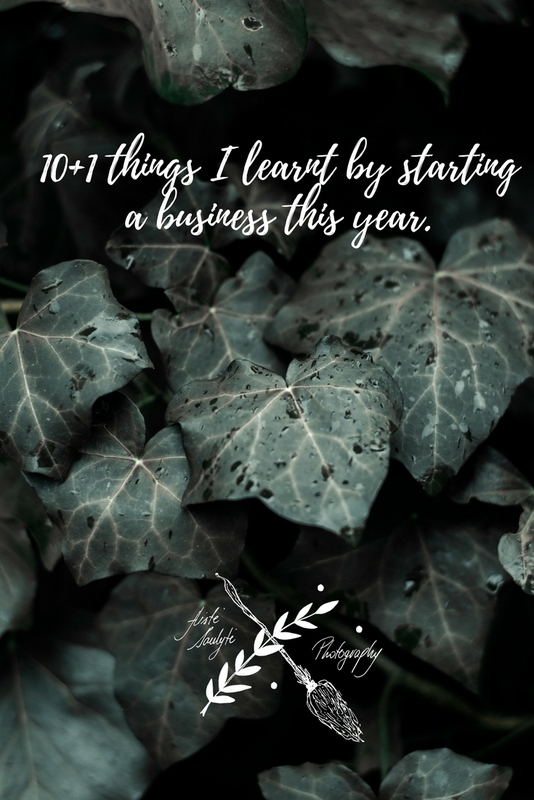 One of the things that really helped me this year, in learning all about creative business, how to start one and how to run one, is reading and listening to other people's experiences and reflections. As many creative business owners know, starting this sort of endeavour can be a really lonely road sometimes. But precisely because of that, it seems people in this industry are particularly keen to share their experience and encourage others who are on a similar path. Learning about other people's trials and tribulations, their thoughts and feelings, has inspired & uplifted me. It offered me compassion, insight & understanding whenever I felt lost, confused or intimidated by where I'm at and what I should do next. So my hope in writing this blog is that it will provide some understanding and insight to some of you, who may be on a similar path as I am or was this year. 1. The important thing is starting. And enjoying the journey. As I am writing this, I saw an Instagram post from the Rising Tide Society that said: "A year from now, you will be so glad you started TODAY!". And this is IT! That's the most important thing I have to teach you. Wherever you're going, whatever it is that you dream of - the important things is starting. And start now. This way, you're already one day closer to your goal. And this applies to your larger vision & to your smaller ideas, improvements and habits that you wish to incorporate into your life & business. Start now. No excuses, you don't have to finish tomorrow - just start. And then enjoy the ride. There will be plenty of ups and downs. There will be days you'll be pulling your hair out, and days when you feel on top of the world. But do not get so fixated on your goal, that you completely miss the beauty and magic of the journey. The important thing is to enjoy the process of learning, growing and improving that you will inevitably undergo in this creative business journey. I mean, who would enjoy reading the Lord of the Rings, if it took Frodo one day to get on a helicopter, fly across Middle Earth & throw the ring into the Cracks of Doom & the story was over? Boring. We all love a happy ending, but it means nothing without the journey full of discovery, loss, friendship, challenges and little victories, and a lot of walking (if we're still talking LOTR). Granted, the books take a century, and a half to read and there's a whole load of walking that we'd love to be able to skip, but it's just like in real life, or in business - if you want to walk to the other end of Middle Earth, you better start soaking in the scenery, because you'll be at it for awhile! There's no short-cuts. 2. Start creating a life and work balance now. Trust me - it will help you in the long run. Because building a business is something that takes time, you might want to start thinking about your daily habits and your overall quality of life. If you're not happy with how things are now, most likely it will impede on your business journey. It's not a short journey, so it will require you take care of yourself in the meantime. You'll need your energy, your vitality. That means - rest, when you need to, when your body is asking you to. Create work and life boundaries now, it will help the calm & focus of your mind when you get to work. It's something I'm still learning, as all these other lessons here. Trust me, I need to read & re-read this blog just as much, if not more, as anyone else out there does. Just like you need to enjoy your business journey, you also need to live a life! You're here on this Earth for only a time. Make the most out of it whilst you can. Make time for your loved ones, your friends, your family. Create opportunities for travel, for adventures, for slow days reading books and long walks in nature. I know firsthand that it's not always possible, sometimes money or work will be in your way. But if you don't try, you'll come to the end of the year, and I say this with a heavy heart, and you'll come to see how much you miss it all. 3. Role models are really important. But always seek to be yourself. You can and should learn from others, and their mistakes. But you will and you have to make a lot of the same mistakes yourself. It's how you figure out what is right for YOU. By making your own mistakes you will learn your own unique ways to overcome future obstacles. And you learn your own way by following your own unique vision. It's helpful to learn from the greats, from those who treaded the paths that you wish to walk. But you have to create your own path, you don't become a great by emulating someone else's journey. When you look at other people's work - look to be inspired to create something yourself, to be encouraged. If they have achieved great things - so can you. Analyse other people's work, their brand, their online presence and learn how they got to where they are. Take something from that, but do not expect to walk the same way or create the same work & identity. As Oscar Wilde said: 'be YOU! Everybody else is already taken.' The world only wants and needs one Oscar Wilde, one Annie Leibovitz, one Brandon Woelfel. You've got to bring your own magic to the game. You won't start from your greatest work, but by learning, practicing and continuously creating - you will end up creating unique, great work that will come from your heart & soul and it will have YOU all over it. And that work will inspire and encourage others. Learn about techniques, styles, ideas in order to understand how to achieve certain results if you so desire, but do not aim for the same results. Learn to wield the same tools, with the same proficiency, but to in order to create something different. It doesn't have to be completely new & unlike anything ever seen before, it just has to be from YOUR heart, and not because it's insta-worthy or gained someone else glory. 4. Comparison is the worst trap. Focus on YOU! It's easy to look at other great artists and business people and compare your work to theirs. It's equally easy to compare your lives, your habits, your self-esteem, your wardrobe and everything else to theirs. If you find yourself constantly looking at someone's work or life and feeling like you're not good enough, not talented enough - STOP & unfollow. You don't need them in your life. Follow people who's work and life make you feel good about yourself, people who embrace their own imperfections and encourage you to embrace yourself. If you're constantly looking at other photographers and their work, it's really easy to fall in that comparison trap and to get really critical of your own work. But please be good to yourself and remind yourself that you cannot compare your beginnings to someone else's 10+ years of experience. Even if you just started your business and they also 'just started their business.' No one can actually tell what that really means. Maybe you just picked up the camera and started a business. And you're comparing yourself to somebody who has been honing down their craft for over a decade but only just began to earn money from it. Yet they have connections & online following that you cannot boast of. Do you see where I'm going? You can't compare yourself to them - you're at completely different parts of your journeys. And every journey is different, and full of all kinds of set-backs and opportunities, most of which are never shared online. So just focus on your own journey. I know it's all easier said than done, but trust me, not the little evil voice inside your head. And I promise to try and not listen to mine. Because we all do this at times. Which is why it's important to remind each other that our journeys are our own and incomparable to anyone else's. 5. It's hard. Patience is key. None of what I'm saying here comes easily, to anyone. Your journey will take as long as it needs to. And it will be difficult. But the rewards will be greater. They cannot be measured by time or effort. On particularly difficult days, with a lot of resistance from my self-critic, I try to draw my mind to a different comparison than that of where I am versus where I wish I was. I try to think of where I was a year ago, or two, or three. And recount all that I have achieved and done in that year. Even if those milestones are very humble. A year ago, I had just started. I had only begun to learn, to explore and to work on this dream of mine. Two years ago, I was too scared. Five years ago, I would only dream of it. My intention for this year is to learn more patience. And to practice daily gratitude. It is when we appreciate and celebrate the small things in our lives that we build the capacity to really celebrate the bigger things. We must embrace each and every day, instead of using it as a measuring stick to beat ourselves with. This journey is hard, patience is hard to maintain. But remaining patient and grateful for what we have, and where we are is the key to a happy, healthy and sustainable life. 6. Your voice and your contribution matters. To start consistently blogging & sharing my thoughts, experiences and insights is one of my bigger goals this year. 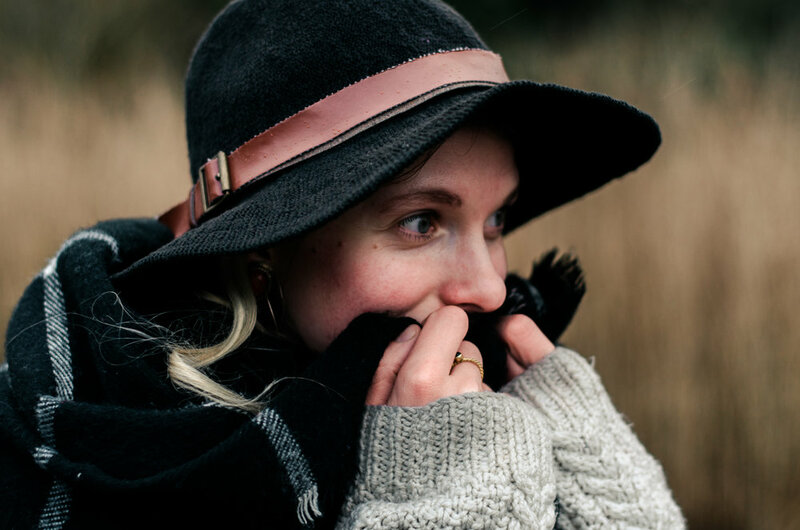 As probably many of us do, when starting to blog - I have plenty of self-doubt. It's that age-old question: Does the world need yet another blog, podcast, photographer, artist, etc. Perhaps the world doesn't. But does the world need people to do what they love, to share what is in their hearts, and to, above all, connect with each other, uplift each other and offer support, compassion & understanding? It does. And each of us is unique and capable of bringing something new or something of value. And so I will add my voice to the ocean of beautiful voices out there, for the sake of that one or two people who will connect with & find comfort in my voice. I have no doubt that your voice would make a difference, too. 7. Always remember your reality & make peace with it. The thing about a creative business, or any business for that matter, is that there are no quick fixes. Anyone who advertises that "one thing that will make your business" does not mean that you will only have to do ONE thing in order to be successful. Whatever it is that they think you should or should not be doing, is either a tool you should adopt or a habit your should gain or break. The key is doing the work, and consistently showing up to it. All else is strategies, tactics and tools. They will help you, but you still have to do the hard work and put in the long hours. But it is worth it and it's the only way. Unless your trust fund can buy you or fund your way to a functioning & successful business, you will have to do the work. And very likely you will have to do other work to fund yourself until it starts bringing you consistent income. Please remember, there is no shame in that. Keep your head high, you are doing what is necessary to support yourself and your dreams. Making a jump to freelancing is talked of in ways that make it sound like a bit of a fashion. But you've got to do your own math, assess your own situation and choose the wisest way possible. Make peace with your own reality. And take strength in the fact that despite all your obstacles, you may persevere. 8. Learn to become your own cheer section, but surround yourself with people who support you. You're not doing this for your Aunt Betty who thinks you're wasting your time. You're doing this for your clients. And because of YOUR dreams. The only opinions that really matter are those of your ideal clients. Make them your focus. Do not lower or change your voice, because you think it'll be embarrassing when your mum reads it. Or that old schoolmate that used to bully you. The old school bully should not even have any space in your head. Your mum (gran, dad, uncle, brother, sister, cousin three times removed and that great aunt you saw once) matters, because it's your family. But learn to keep these things separate. Your mum is not going to make your business work. As much as you love people who surround you, when it comes to your business - you're likely to have to become your own cheer section. Never depend on other people's approval and ideas. Learn to be your own biggest fan & create work that makes you happy. When you do that, you will attract people who will connect to that passion & work that you put out there into the world. They will become your tribe, your support. Even if it's just one or two people at the start of your journey, focus on them. Their support will help you through the difficult days and they will be there to celebrate your each and every victory. Surround yourself with these people who believe in you. They will be the ones who invest in your vision & your services. You cannot be right for everyone, but you can show up for people who are right for you. 9. It's all about having a clear vision & breaking it down into doable steps. Starting a business is overwhelming. I spent months this year trying to figure out what that even means or where to begin. But the most important thing I realised is that it is possible, no matter how daunting it seems at first. The key is to create a vision that you want to aim for and then break it down into steps that are actually doable. And this way, step by step, month by month, you will eventually get closer & closer to where you're going. You vision may mould and evolve, as will you, but that is part of the wonderful process of life - we never stop growing and aiming for more. To begin this process of creating a vision, you have to look inside first, to delve deep into your utmost desires and passions. What is it that you really crave to have in your life? How do you want your life to look like? If anything was possible - how would your dream job look like? Do not restrict yourself, because it's better to work hard & long towards the seemingly impossible goals, than to work towards goals you don't really & deeply desire. To keep trusting your vision will be the hardest thing to do, because it involves fear, self-doubt, and all that baggage from your childhood that possibly keeps you from believing in yourself. The easiest thing is to actually work towards your goal. Because if you break it down - all the steps that are required to get to where you're going are very possible, and very doable. So just start. And trust that one day at a time - you will get closer. 10. Instagram can be hell and saviour all at the same time. Learn good habits & it will really help your business, self-esteem & creativity. This one is hard for me. My relationship with Instagram & any other form of social media is difficult. I love and hate it all at the same time. I've spent this year learning how to improve my habits and how to wield it in a useful manner. The wonderful thing about Instagram is the community that you can find within it. It's a tool that allows us to reach people who we otherwise would probably never meet, but who have a similar set of values, interests and a need for a creative community as we do. Find your Instagram tribe and it will bring numerous benefits to your life and business. If you delve into Instagram because you want tons of followers and that's all, you'll find it disappointing and soul-crushing. But if you go to Instagram to find people who inspire you and to connect with likeminded souls - you'll find an abundance of that. I am still learning to give this community more time and more effort. Often I want to run to the woods and not look at my phone at all. But finding a good balance is really important. I'm learning to use social media more often, but wisely and for shorter amounts of time. Offline time is important to my health and creativity. If you learn good social media habits from the get-go, you're less likely to find yourself aimlessly scrolling and looking, whilst your self-esteem dwindles faced with the high-light reel of other people's amazing lives. Don't let yourself go down that rabbit hole, it's dark and lonely. But if you learn to wield this tool for the right purposes, it will lift your spirits up, it will help to launch and run your business and it will bring you inspiration & a sense of connection. You might even make real life friends from it. Just make sure to foster your real friends, family and life at the same time. This is more of a tip, rather than a profound lesson. It's probably why I chose to mark it as a +1. In many ways, it's been my +1 in this creative business journey so far. Being a creative can be a lonely road. Although to an outside eye something like photography can seem like a really social job, in reality we spend countless hours by ourselves - editing, improving the website, marketing, planning, emailing, doing our accounting & taxes, writing this blog, and the list goes on. It usually means being stuck in between four walls for days on end. Whilst the internet is full of incredible resources in the form of blogs, articles, youtube tutorials and books, there is nothing sort of the magic of podcasts. I discovered podcasts this summer and have delved deeply into their world ever since. I've listen to at least a few episodes a week. When you spend all day by yourself, staring at your computer screen - it's easy to feel alone. But putting on one of your favourite podcasts feels like having a business bestie in the room. A lot of these podcasts are really casual, fun & packed full of great questions, practical tips & profound advice that will help you dig deeper into your Why & Vision, and take your business to the next level. A lot of them are simply interesting & insightful conversations. And it brings you ways of thinking & seeing you perhaps wouldn't have thoughts of otherwise. Or sometimes it makes you yell 'yes! yes! yes! - this it exactly how I've been feeling & what I've been thinking!'. And it makes you feel less alone & more connected to other people in this industry. You grow familiar to their voices & their ideas. It's just like when you read a book or watch a TV show and feel like you become friends with the characters within the story. I promise to write a blog about my favourite podcast & create an PDF resource that can help you find your next favourite one. In the meantime, if you haven't given it a go yet - next time you have a bath, find Hashtag Authentic or Courage & Spice and experience their magic yourself. I really hope that these insights and reflections will help you in your own journey.